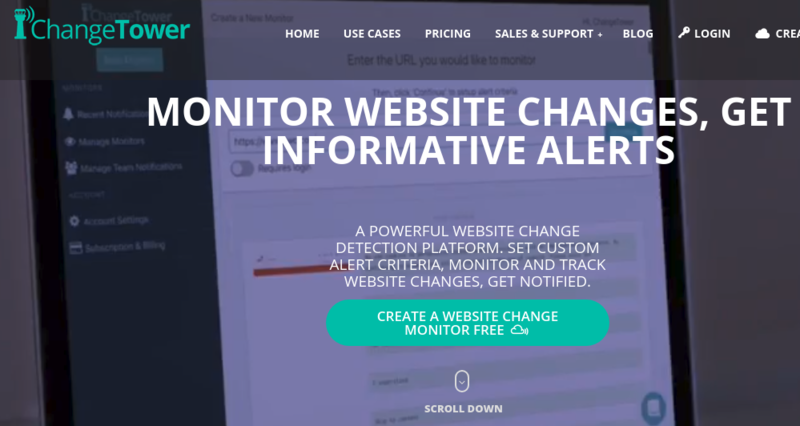 Why website change monitor is important? 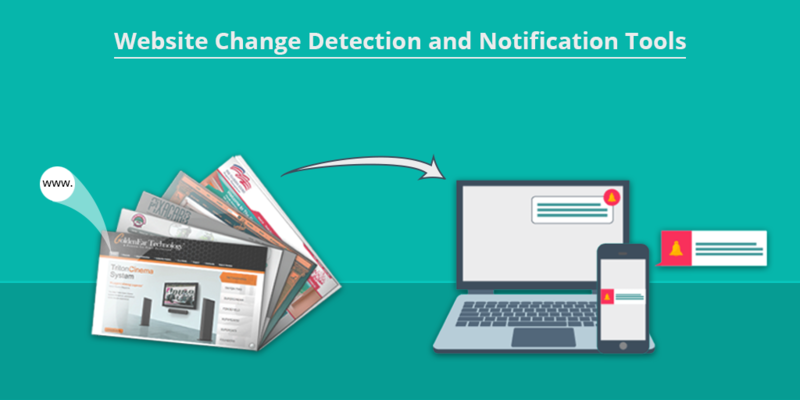 What is Website Change Detection, Monitor and Notification? Website change detection is all about tracking and monitoring changes that are made on the websites or web pages. Earlier, this process was manual. One would need to revisit the website in order to monitor website changes. Or one would need to search for the content again and detect changes manually. However, website change detection and notification have now become fully automated. Since 1996, tools have been evolved to automate the process. At present, these tools have become highly sophisticated and efficient. With the help of these tools, it has now become possible to track and monitor website changes as they occur. While website changes don’t occur that often for many websites, it is advisable to keep in mind that website changes occur quite frequently for segments like e-commerce. In order to keep pace with changes happening in e-commerce and other such dynamic segments, it is imperative to monitor website changes as quickly as they occur. As businesses have gone online and specialized segments such as e-commerce have come to the fore, website change detection, monitor and notification have grown enormously significant. To cater to such a demand for website change monitor, the industry has enthusiastically responded with a flurry of website change detection, monitor and notification tools. Since there is a phenomenal growth of the Internet, e-commerce etc., web pages get updated more often than ever. This is why website change monitor is of paramount significance. It does not matter what your business may be, monitoring website changes are vital for you. For instance, you could simply be a shopper. However, if you can leverage website change monitor tools, you can buy at the best possible price. Likewise, if you are a store owner, you would be able to keep track of how your competition is doing business. You would be able to monitor website changes in terms of price and accordingly devise your strategies. You can monitor your own website and ensure that nobody makes changes on the website without your knowledge. If you are a website owner, you would be able to track whenever one of your pages is not available online. If you are a recruiter, you would be able to keep track of new job openings posted by different companies. The applications of website change detection, monitor and notification are endless. No matter which industry you belong to, website change monitor has its unique applications in how it can make your work easier. On account of its myriad applications, website change monitor has emerged as integral to the way companies go about managing and developing their business. Wachete is a pioneering website detection and notification tool. It stands out for its wide array of spectacular features and commendable service. Whether you want to monitor web changes to any public web page or password protected pages, Wachete provides peerless service in terms of website change detection. With its amazingly seamless notification service via email and push notifications, you can keep track of website changes wherever you are. It offers a few services for free for a trial period. However, when you need to pay for it, it’s highly cost-effective and totally worth your investment. In all, Wachete rightly tops the list of website change detection and notification tools. 7 days free trial period for any paid plan. Basic price starts at $4.90 / month for monitoring 50 pages per hour. Monitor updates of text in PDF, MS Word, DOCX, XLSX files or JSON on the web or track size changes of files. You can view your tracker data by sorting data. You can share tracker data with anyone via unique sharable link. You can download data in Excel sheet. Wachete integrates with Zapier. By integration, you can create your own custom workflows. REST interface is in place for 3rd party partners. Mobile app for Android, IOS and Windows through which anyone can monitor from anywhere and get notified. If you are looking for a tool that effortlessly monitors website changes, with or without apps, you should go for Visualping.io. It is a robust website change detection and notification tool that transforms your experience of tracking changes to a variety of web pages. All you got to do is select the web pages. Then, you need to sit back and relax as Visualping.io will monitor all website change for you. It will compare the pages and notify you if there are any changes. Whether the remarkable technical finesse or matchless customer service, Visualping.io is simply unrivaled. By choosing corporate plan you can get x2 as many credits compared to starter plans. This is 4 free checks a day (instead of 2) or 125 free checks/month. For Corporate: It starts at 5 accounts of $24 plans for a total of $120 per month. Corporate plans are paid annually (minimum $1,200) and receive 2 months free. Monitor web page changes to any public web page. You can manage and modify your jobs in your Visualping-Dashboard. Visualping.io offers access to public API and custom development work. Automatically alert visitors when important things change on your site. Install the extensions to monitor websites directly from the website itself, without having to copy-paste the URL into the web-based tool. You get alerted anywhere with the mobile apps. The apps give you access to some of the most important features of your dashboard such as the ability to review changes on superposed images as well as false alarm management, trigger sensibility and frequency of checks. The apps will also allow you to review basic account settings. Other pro-tools available are Slack, Hipchat, Webhook, RSS and text message notifications, false alarm reduction tools. ChangeTower is a powerful website change detection and notification tool. It is an efficient cloud-based tool that provides amazing custom alerts every time there are changes on the web pages. No matter what you want to track and monitor, ChangeTower is one of the most reliable tools in the market. 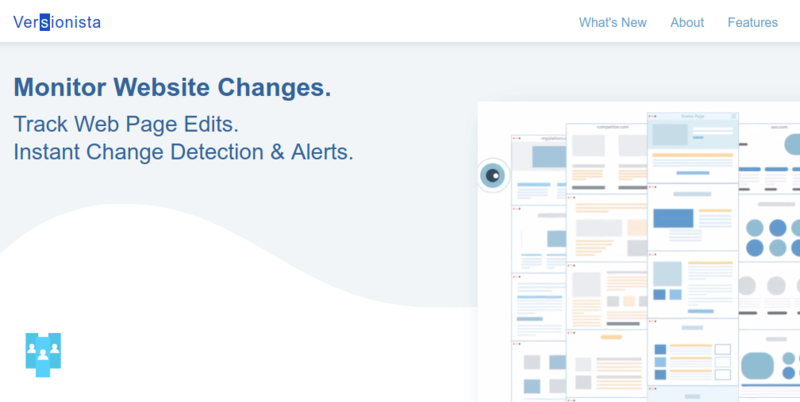 From visual changes to keywords and code updates, ChangeTower towers above the rest when it comes to website change detection and notification. For its numerous features, wide variety of services and exemplary customer service, ChangeTower has earned its rightful place in top 3 website change detection and notification tools. Basic plan starts at $8/month (Billed Annually) for monitoring 10 web pages in every 20 minutes. You can also quickly locate the changes that matter most, reference and compare time-stamped web page snapshots. All of premium plans offer expert, dedicated support from real U.S-based ChangeTower staff. Chatbot is also available for support. ChangeTower offers limited API access to select enterprise customers and select distribution partners. Multi-language support – track pages in Chinese, Japanese, Russian, Greek etc. 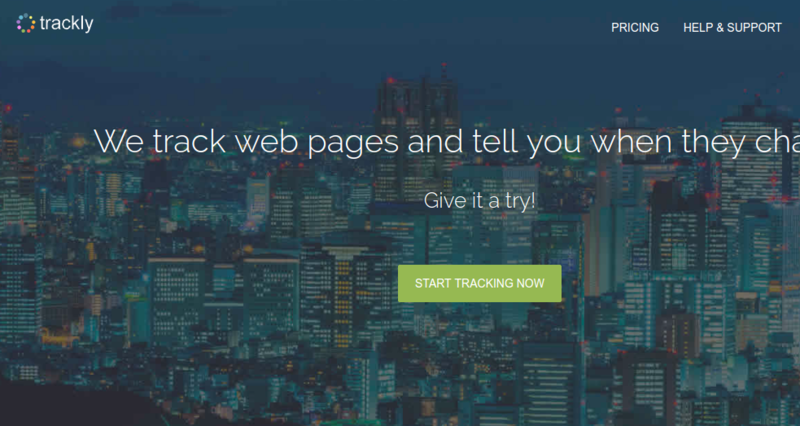 Trackly is an extremely efficient website change detection and notification tool. It has plenty of functionalities that make your task of monitoring website changes a whole lot easier. You can simply select a particular part or multiple parts of a web page. Whenever there are changes, Trackly sends you prompt emails regarding the website changes. Changes would be highlighted so that it is easier for you to spot the changes. It provides a host of functionalities regarding website change detection at an affordable rate. You can avail a 30-day trial for each plan. It is one of the leading website change detection and notification tool because of its functionalities and prompt customer service. Basic plans start at $9/month for tracking 20 web pages hourly, daily or weekly with 10 versions stored. Data Retention: It stores 10 versions of every web page. You can access and monitor your task through dashboard. You can share task with read-only view by sharing summary of task link. For instant website change detection and prompt alerts, Versionista has carved its niche in the market. For even highly customized and specific requirements, Versionista can provide reliable and comfortable functionalities that can help you monitor website changes. Versionista also stands out for its fast and efficient notification service. When there are changes to the web pages that you are interested in, you get notified on email as well as Slack. For its unique functionalities and robust customer service, Versionista has rightly become a reliable website change detection and notification tool. You can monitor 5 URLs every day for free or 150 checks per month. Basic plans start from $99/month for 600 URLs. Versionista generates monitoring reports for comparing and analyzing tracker data. You can download track data into Excel and CSV files. Sken.io is a reliable and proven website change detection and notification tool. It is simple to use and easy to manage. All you need to do is enter a URL of the web page and Sken.io will notify you regarding any and every change that occurs. You can use a Chrome extension or a mobile application if you like. There’s a 14-day free trial that you can avail to explore its unique features. For its remarkable features and prompt customer service, Sken.io is making a mark on the market. Data Retention: It stores last 12 snapshots per job. Changes in numerical values can be displayed in a chart. It is quite easy to use a dashboard to manage tracker. If you are looking for an efficient as well as affordable website change detection and notification tool, your search ends with Distill.io. It quickly monitors website changes for web pages of your choice and instantly notifies via a variety of tools that it leverages. You can get the notification on email, mobile or SMS. You can simply relax once you get access to Distill.io because you will not need to worry about minor or major website changes. It will provide seamless website change detection with reliable customer service. Data Retention: It stores 20 versions of every web page. 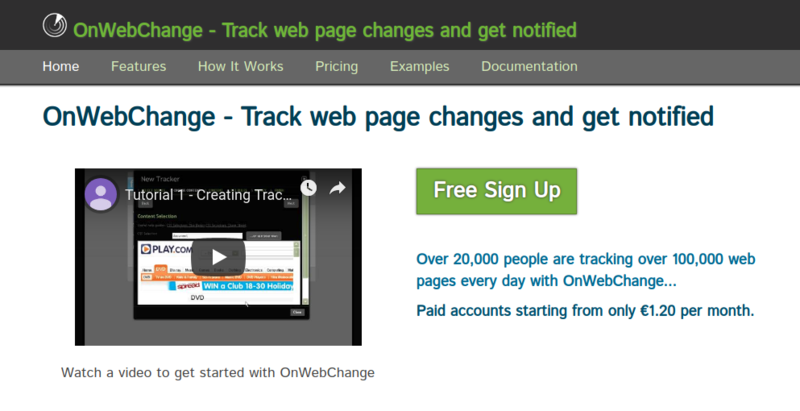 Pagescreen allows you to keep track of website changes “automagically”. With Pagescreen, you get instantly alerted on every small or significant change that occurs on web pages you are interested in. Monitoring website changes was never easier. Pagescreen provides a host of functionalities that you can capitalize on. You can choose the way you would like to be notified. You can get alerts via email, Slack or Webhook. A 14-day free trial can help you get first-hand experience of magic that Pagescreen weaves when it comes to website change detection and notification. Basic plan starts at €14.90/month for 1000 checks. Compare, sort, organize and share your screenshots anywhere, anytime using dashboard. REST API: Build powerful connectors and extra automation with RESTful API. Whether it is verification of metatags or structured data changes, SEOsan is emerging as a remarkably reliable tool to monitor website changes. You may have a small website or a huge project, SEOsan can efficiently detect website changes and help you keep track of changes that occur. It also provides prompt customer service that you can rely upon. For its unique focus on SEO related functionalities, SEOsan is growing as a website change detection and notification tool. You can track and access your data by sections like page snapshots, robot.txt, and sitemap etc. As you can see, there are a variety of website change detection and notification tools available in the market. Each one is unique in the way it helps you monitor website changes. Each one is also unique in the way it notifies the changes to you. It is not possible to pronounce a judgment regarding which tool is the best among all. It will depend on your customized and specific needs. You need to study your needs and accordingly choose a tool that caters to the specific needs you have. Since website changes have a clear bearing on the way business is done online, choose the best possible website change detection tool and gain a competitive edge over others!